Last week, we announced that OTELCO had lit a 10 gig ring throughout the northern and easternmost sections of the Three Ring Binder’s network. The Northern Ring of the Three Ring Binder (In Blue). The new network utilizes the northern ring of the Three Ring Binder, connecting 77 communities in Aroostook, Hancock, Penobscot, Piscatiquis and Washington counties, and brings a significant amount of additional capacity to some of the State’s most rural areas. What does it all mean for residents in these areas? Unfortunately, it doesn’t mean that we’ll be offering 10 gig Internet service to homes everywhere in all of those towns just yet. More fiber will need to be built to reach all of those homes, but this is an important next step. It does mean that we have a platform to work with communities and businesses in the region, as well as other carriers, to begin building out that larger fiber network. This network provides the capacity businesses need to grow. We were able to light fiber in this part of the state because a handful of large Maine employers, including Woodland Pulp, St. Croix Tissue, and Jasper Wyman & Son needed access to higher speed connections in order to support their growth. Now that the network is in place, we’ll be able to offer connectivity to much smaller businesses at affordable rates. This is important in an age when robust internet connection is crucial to success in almost any line of business, including blueberry farming and paper making. It supplies bandwidth for cellular backhaul. If you believe wireless is the future of communication, you’ll still need a robust fiber network to make it happen. AT&T, for instance, maintains fiber connections to as much as 75% of its towers today. Having a robust, reliable fiber connection available in Northern and Eastern Maine means cellular carriers will be able to more economically expand their network coverage. Good wireless data coverage is vital to the health of our tourism industry, because increasingly people won’t travel where they can’t get a good mobile data connection. 10 gigs can be the backbone for community broadband. 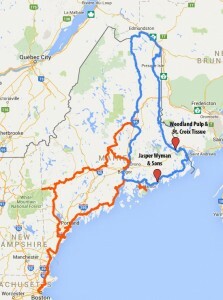 Lately, many Maine communities have become interested in building fiber optic broadband networks of their own. For communities in the region, an ample supply of reliable bandwidth is an important building prerequisite for constructing a network. This new 10 Gig ring will supply enough middle-mile bandwidth for local communities that aim to offer gigabit broadband to homes and businesses. The OTELCO network can connect business locations anywhere. Our network extends well beyond the confines of Northern and Eastern Maine, and we partner with regional and national carriers, so we can connect businesses everywhere. Recently we helped another large employer in the region connect its locations in Maine to other sites in New York and Canada. If other large companies are going to come to Maine, they’ll need similar connections. Rings provide the reliability for mission-critical systems. Reliability is crucial for businesses in financial services, healthcare, and many other industries. If these businesses are going to locate, expand and grow in Northern and Eastern Maine, it’s vital to have reliable connectivity available to them. Fiber rings allow signals to be re-routed almost instantaneously should an accident or fire “cut” the ring in one direction, making them much more reliable than point to point connecitons. OTELCO’s 10 gig ring in Northern and Eastern Maine is just the next step in making Maine a better connected place. We look forward to partnering with businesses and communities for continued progress.